AOMEI Backupper Free .Last Friday, a piece of malware began doing the rounds in the UK, locking PC users out of their data unless they paid up a ransom in Bitcoin. Now more than 200,000 organizations in over 150 countries and at least 16 hospitals in the UK and many telecom firms in Spain were attacked by this so-called WannaCry variant of ransomware. WannaCry can be ranged attack Windows 445 ports, which without any action, as long as user switched on to the Internet, WannaCry can execute arbitrary code on the computer, and then implanted blackmail viruses and other malicious programs. So what is the most efficient way to prevent from WannaCry? Backup and Restore will be your life essentials to avoid becoming a victim of ransomware. As this massive ransomware attacks on May 12, 2017, AOMEI Tech has paid a great deal of attention to it and now the specially designed backup and restore software — AOMEI Backupper Free, it has been released to protect system and files from WannaCry cyber attack. What are the main features of AOMEI Backupper Free(especially for WannaCry Ransomware)? 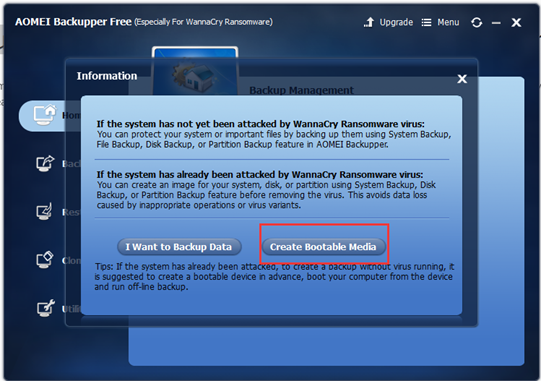 Backup system and create a system image to protect Windows and applications against ransomware. Backup entire hard disk (HDD), SSD or specified partitions to create an image file to prevent from WannaCry. Backup your most important files and folders in case Ransomware Encrypt the files for “ransom”. Clone a hard drive to another for backup to protect against the crypto locker. You can protect your system or important files by backing up them using System Backup, File Backup, Disk Backup, or Partition Backup feature in AOMEI Backupper. Step1, download AOMEI Backupper Free, install and launch it. then click “ I want to Backup Data” to enter the main interface. 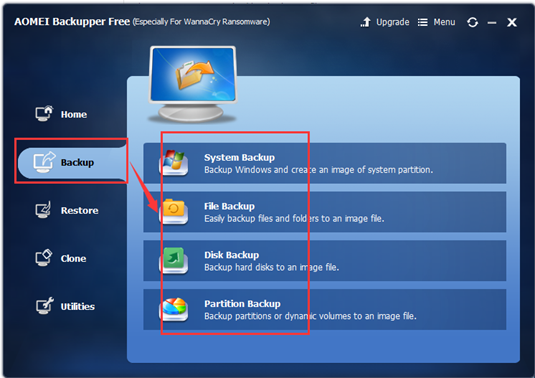 Step2, now you will enter the main interface, there are four backup topic columns under the “Backup” tab: System Backup, File Backup, Disk Backup, or Partition Backup. You can backup all of your important information to protect your system or important files. You can create an image for your system, disk, or partition using System Backup, File Backup, Disk Backup, or Partition Backup feature before removing the virus. This avoids data loss caused by inappropriate operations or virus variants. Step1, download AOMEI Backupper Free, install and run it. Then click “ Creat Bootable Media” to produce the bootable device. Step2, in the next window, select “Windows PE” and click “Next” button. AOMEI Backupper will check whether your system meets the corresponding requirements. If not, you need to install Windows AIK. Click the “Next” button to continue. 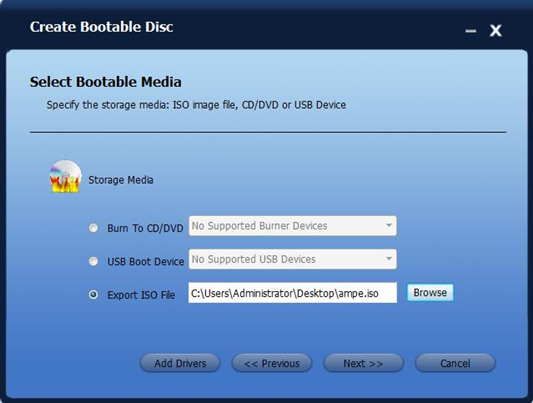 Step 3, if you want to use a USB device or CD/DVD as the bootable media, please plug it into the computer in advance. Here we choose “Explore ISO File”, which enables you to create an ISO image file. 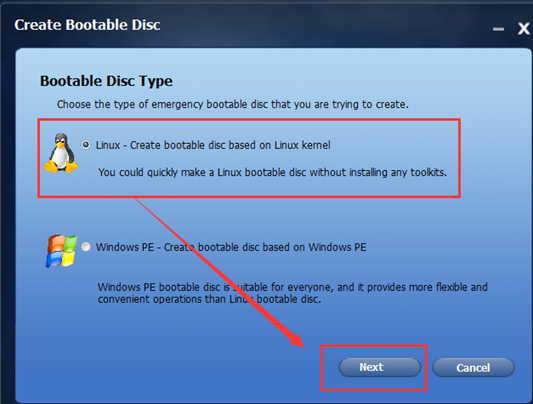 Then, click the “Next” button, you will start to create Windows PE bootable disc. Step 4, now you just need to wait for the process to complete, then click “Finish”. 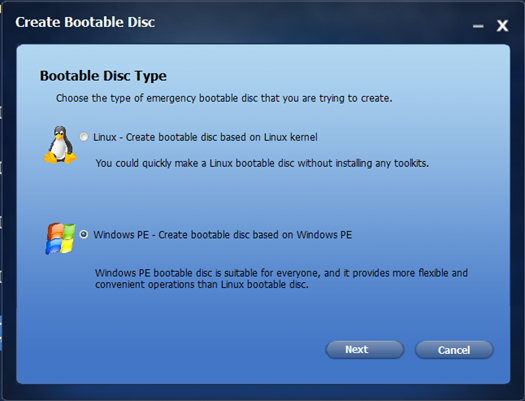 In addition, creating a Linux bootable disc is similar to creating Windows PE bootable disc. 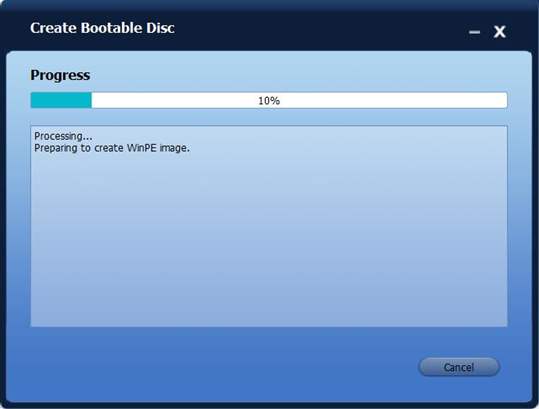 The only difference is that you can create this kind of bootable disc without meeting any requirement, so there will be no need to download and install Windows AIK. But Linux bootable CD might be less compatible. AOMEI Backupper Free is a backup free change ware that can help you backup system, files, disks, partitions on computers and laptops by creating backup image files and restore all your important data when your computers have been attacked. Backup not only to prevent from more serious data loss caused by misoperation or a new mutation of Ransomware but also “froze” the countdown of Ransomware. AOMEI Backupper Free can help you to against Ransomware like WannaCry, Wanna Decryptor, Cryptolocker, etc. But as a productivity tool for PC, the necessity and the habit of the data backup is very important, very important, very important what is important (three times)! Every one of us should form the good habit of backup to prevent virus attack now.